Zombies and superheroes rejoice: you don’t have to settle for boring concession stand food and drinks at Comic-Con. The spirit of season has taken over several spots around San Diego, offering crafty cocktails, nerdy brews and tasty bites that any caped crusader or would approve of. 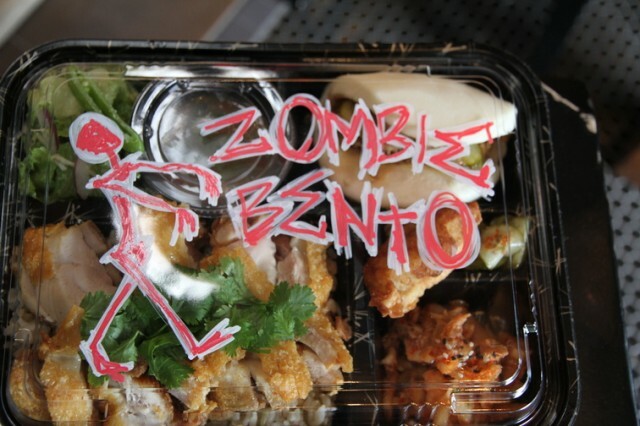 Gaijin’s Zombie Bento Box photographed by Chris Morrow. Check out Chris’ CNN iReport for more great Comic-Con info. Located close to the Convention Center in the Gaslamp District, Gaijin Noodle + Sake House serves up a bento box that’s not for the faint of heart: their special Comic-Con edition “Zombie” bento boxes feature “pork blisters,” “buried and fermented bloody cabbage,” and “raw flesh of fish with cold, grey worms” (which translates into fried pork gyoza, kimchi, and yellowtail with cold buckwheat noodles, for those of us that don’t speak Zombie). 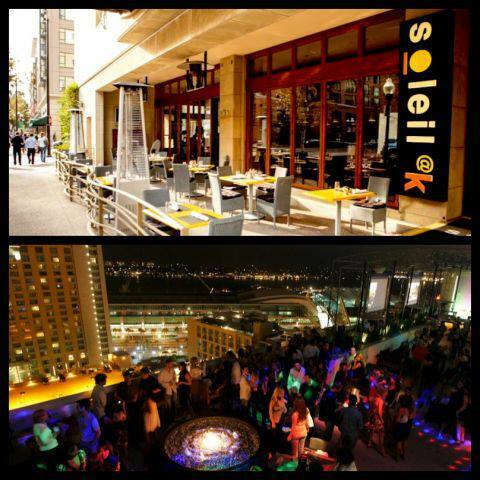 Marriott Gaslamp Quarter’s Soleil @K will be offering a special Comic-Con inspired menu. Also near the Convention Center, the Marriott Gaslamp Quarter’s Soleil @K restaurant and Latitude Lounge offers up a comic and pop culture-inspired menu this week. Try the “Wolverine” (prime rib) or “Grimm” (blackened chicken) sandwiches. In the north end of downtown, the Prohibition-inspired restaurant Chaplos pays homage to classic comics from the 1930s with an event titled “The Golden Age meets the Speakeasy Era.” Comic Con fans are invited to stop by on Friday, July 19 and Saturday, July 20 for an evening of cocktails and traditional jazz. Wear a costume, memorabilia or t-shirt showcasing your favorite Golden Age comic book hero (Superman, Batman, Captain America, Captain Marvel and Wonder Woman) or show your comic con badge and receive a free specialty cocktail from 7:00 to 9:00 PM. On Saturday, July 20, beer fans and comic fans alike will want to head to the Embarcadero Park North for the Heroes Brew Craft Beer Festival. San Diego’s first Superheroes themed craft beer festival will feature dozens of craft breweries pouring samples, live music, and a costume contest. General admission, which includes 20 tasting tickets and a mug, is $45, and proceeds benefit the San Diego Coastkeeper and Surfrider Foundation. Spot any other Comic-Con theme food and drinks around town? Let us know about them in the comments below! As soon as I arrived in San Diego the last week of February, I knew that the sunshine and warm breeze would capture this East Coast girl. From the beginning of our TMS 2011 Annual Meeting & Exhibition, we all felt that the San Diego Convention Center and the entire city would offer a great break from the cold winters of Pittsburgh. On my first night in San Diego, I was able to go out for a fantastic meal at The Palm Restaurant in the Gaslamp Quarter and enjoyed a fantastic filet trio meal. I recommend the Chocolate Bread Pudding, top notch! The general manager was fantastic and gave our group a private room to dine in while there and we enjoyed every minute of it! On the first Sunday I was in town, I was able to go for a morning run behind the convention center and enjoy the beautiful views of the bay and even ventured over to Seaport Village, which was a great way to start one of many long working days in San Diego. Our host hotel was the San Diego Marriott & Marina Hotel, which was conveniently located next to the San Diego Convention Center. We enjoyed all of the staff at the hotel and especially enjoyed the convenience of the proximity to the center. Later in the week, I was able to have cocktails with one of the sales staff from the San Diego Omni at The Marble Room and loved the old world charm that the location had to offer. Dressed in flapper style, the servers were fun and welcoming with their old-fashioned style drinks. I also had the chance to enjoy breakfast at The Broken Yolk and had a great breakfast burrito with excellent guacamole. To end my stay in San Diego, I made a trip to visit the USS Midway Museum. As someone who enjoys history, this was a great way to end my trip and enjoy one of the neatest historical elements in San Diego. San Diego was a great city and for someone who came home to snow on the ground, it makes me want to hurry back for another trip!